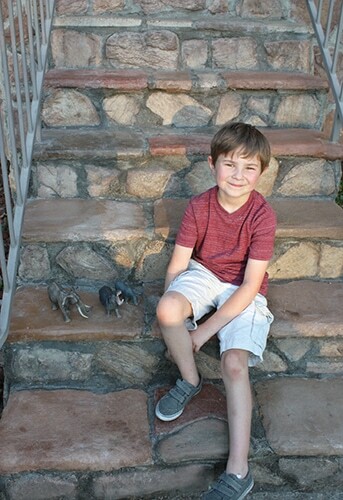 The front steps of our project house had two problems: They were ugly and dangerous. We needed to make them pretty and safe. The front wall and staircase of the split-level home had genuine flagstone veneer, but the stair treads were made of concrete faux stone. Since natural flagstone usually has an uneven face, the tread stones were likely molded from concrete to ensure they had a flat, even surface for people to walk on. However, over the decades the driving rain had pounded down onto the face of the treads and worn away the cement. The rain damage allowed water to seep inside the treads, freeze (and expand) during winter, and essentially demolish the steps from within. The steps deteriorated to the point where a visitor stepped on a lower tread, and it crumbled beneath them. Luckily nobody tripped and injured themselves, but this repair could be delayed no longer. Here’s how we tackled the problem. Our first problem was the lowest stair tread where some of the concrete had entirely disintegrated, fallen out and was beyond repair. Our only course of action was to chip out the remaining material and replace it completely. Using a hammer and chisel we chipped away at the problem concrete until we hit solid material—about halfway through the width of the tread. We then used a small handheld wet saw to define the edges through the solid concrete. After hosing out and brushing away the debris, we had a half-moon shaped hole about 6 inches wide to fill. 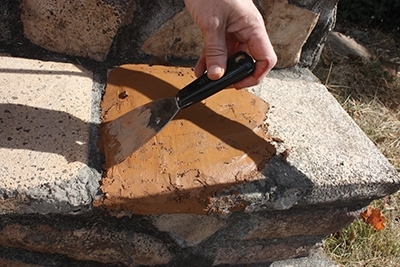 One option was to build a form, whip up some colored concrete and pour a replacement stone to mortar in place. If that were to be our approach, then we should probably cut out the rest of the faux stone and mold the whole replacement using a single concrete color. That would be risky, though, because further demolition threatened to dismantle the surrounding steps and riser stones, and we did NOT want to rebuild the entire staircase; we wanted to repair it. So, we tried our luck in a nearby creek and extracted an actual chunk of limestone from the mud bed. The rock had a fairly flat face and roughly measured the right size and shape (and even color) we needed. 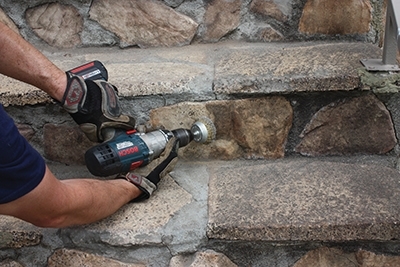 This is the type of out-of-the-box solution you won’t find in a home-repair manual, so we had to get creative with how to fasten the stone into to the steps. A quick trip the local home center produced the strongest adhesive we could find at the time: anchoring epoxy. 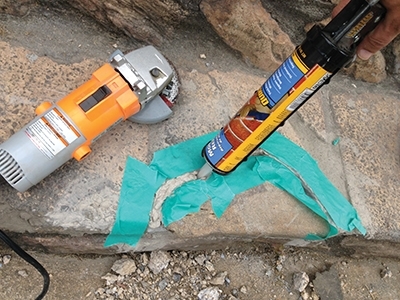 This is a commercial-grade, fast-setting, two-part structural epoxy that’s used for setting anchor bolts, threaded rods, railings and rebar dowels into concrete and masonry. 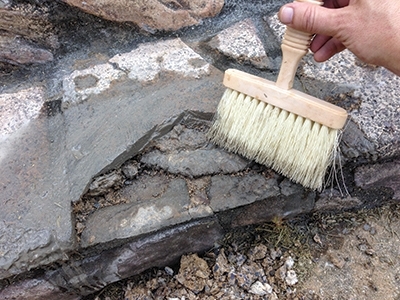 Seemed like tough stuff, so we applied it liberally to the back and sides of the stone, but did not completely fill the edges joints to leave room for joint mortar. 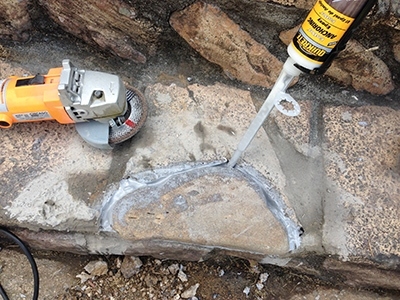 After the epoxy dried, we caulked the joints around the stone with repair mortar to match the surrounding installation. 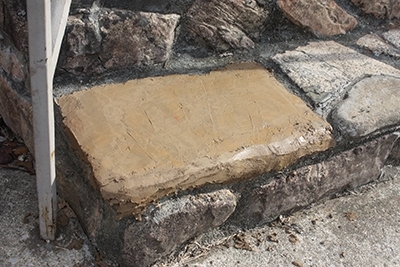 The limestone patch ended up blending well with the flagstone, so the repair was a success. But that was only the first phase of our project. Unless we fortified and resealed the other treads, we would soon be repeating the replacement procedure on the rest of the steps. To avoid this, the steps need to be repaired with a hard, durable cement coating that would bind with the existing concrete. The product also needed to be tintable, and we’d need to color the product in small batches to vary the tones and blend with the surrounding mixed-color flagstone. After a little research we came up with an experimental recipe. 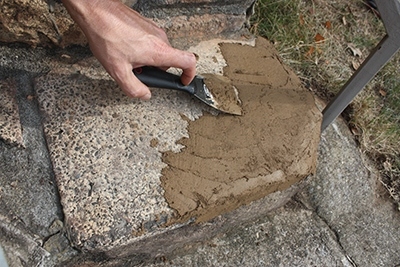 The base was quick-setting cement, which comes in a bag that you mix with water. The cement was dyed with Quikrete Liquid Cement Color, which was added to the cement mix—and “a little dab will do ya” because this stuff goes a long way. We chose two colors, Buff and Terra Cotta, which we combined in varying amounts to closely match the surrounding color scheme. 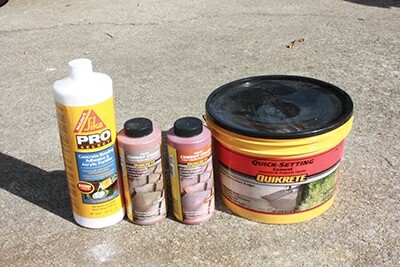 When working with pigmented concrete, keep in mind that the color will lighten once the concrete dries. Our “secret ingredient” was an acrylic fortifier. The Concrete Bonding Adhesive & Acrylic Fortifier from Sika Pro Select is ideal for bonding new concrete to old. It’s an important additive to enhance the bond on applications less than an inch thick, like this project. We mixed it into the cement as a supplement to the water (following the directions on the package). Use only enough water to get the cement to the proper consistency, which should be something close to smooth peanut butter. 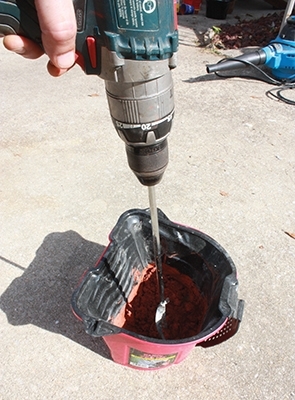 To mix the product you’ll need a bucket and powered drill equipped with a mortar paddle. Mix up only enough cement to use in about ten minutes, otherwise it will start to dry out and set up. Prior to applying the repair cement, the old concrete surface should be cleaned of all foreign matter and loose materials. The bond will always be strongest if all smooth surfaces are roughened or etched, so we scrubbed the steps clean with a wire brush attachment in a power dill. Any dust must also be washed from the surface. We then applied a new layer of colored cement over each individual tread stone, varying the color from stone to stone for a more natural look. The repair cement applies easily with a putty knife, and the thicker the coat, the more durable it will be. However, tread elevation prevented us from raising the surface very high, so the coating stayed approximately 1/4-inch thick, and we feathered the edges thin near the mortar joints. 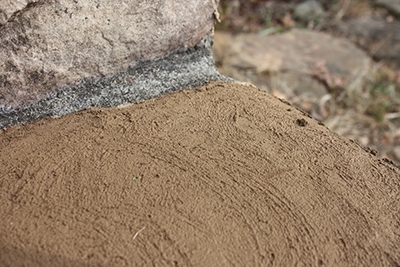 You can also alter the surface texture of the cement. As the product begins to set, use a small broom to roughen the surface if you prefer a rough texture with better grip for walking. 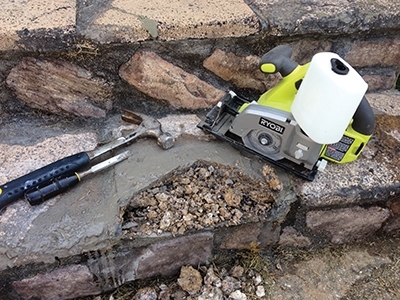 If, however, you’d rather have a smoother surface like that of weathered stone, then glide a wet putty knife over the moist surface to flatten the cement as it cures. 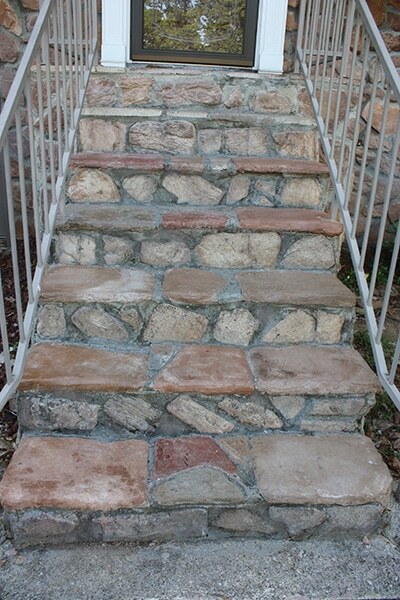 We used two colors of concrete pigment called “Buff” and “Terra Cotta.” The tread coating shown above has a little more Terra Cotta than some of the other stones, which gives it a more reddish hue. Although this is fast-setting cement, we still recommend covering it in plastic sheeting to retain moisture for the strongest cure. Once all the repaired stones had cured for 48 hours, we coated the installation with a concrete sealer. 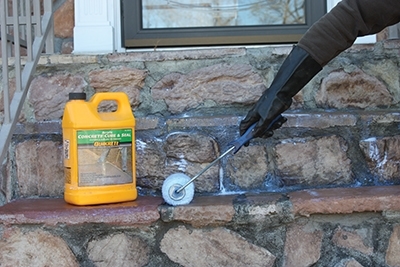 We used Quikrete’s Acrylic Concrete Cure & Seal, a clear acrylic coating that seals concrete and masonry surfaces from water, acids, grease, oils, food stains, salt and more. This is a thin liquid product that can be applied with a paint brush or roller. After the sealer dried, the question remained: Would this repair last? Essentially, we had painted on a thin cement overlay, and I was afraid the new layer might delaminate from the old concrete and flake off. After the cement fully cured, a concrete sealer was applied to the steps to protect them from water, grease, stains and more. But so far (knock on wood), that hasn’t happened. At the time of publication this repair is six months old and has survived rain and freezing temperatures. The look of the treads is much improved, and the structure underfoot is much stronger and safer, which makes for an overall better first impression of the home. 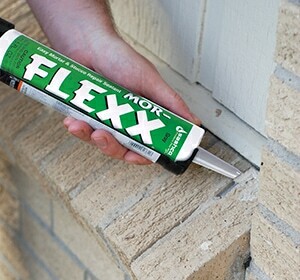 Mor-Flexx is elastic mortar that bends, stretches, and stays stuck right where you need it. It sticks to most surfaces, spanning a gap up to 3 inches wide. It won’t slump, meaning you can apply it on vertical surfaces and not worry about it sliding down. 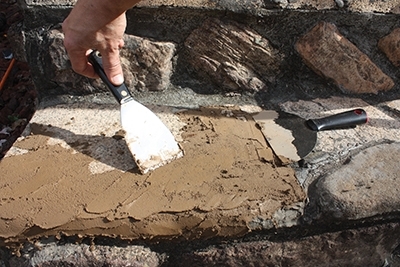 Common surfaces for repair include stucco, stone, mortar in-between bricks, retaining walls, grout replacement along door thresholds, and the exterior of fireplaces. Mor-Flexx is heavily textured to blend-in with these common surfaces. It’s easy to apply, and can be blended with water on a foam brush or in a spray bottle. Mor-Flexx comes in gray or beige, but it’s also paintable. It has a unique stop-flow plunger that prevents the caulking from flowing when you stop pressing the trigger on the caulking gun. Plus, it cleans up easily with water. Learn more at www.sashco.com.